I was planning to wear my new Paige skinny white jeans to the baby shower, in a mostly white outfit I had in my head. But, a few extra pounds this weeks made me feel uncomfortable so I opted for these items which haven't gotten enough wear as it is. Pictures 1 & 2 - Vince top, Vince Camuto print pants and Adia Kibur necklace. BB Dakota unlined leather jacket. Night time baby shower on a Tuesday. A friend asked, who has a baby shower on a Tuesday night, and my answer was, restaurant owners! The couple own another restaurant/hotel in town and we have become good friends. Picture 3 -- Worn yesterday. This is the Boho kimono jacket I got at Zara a few months ago but have yet to wear. 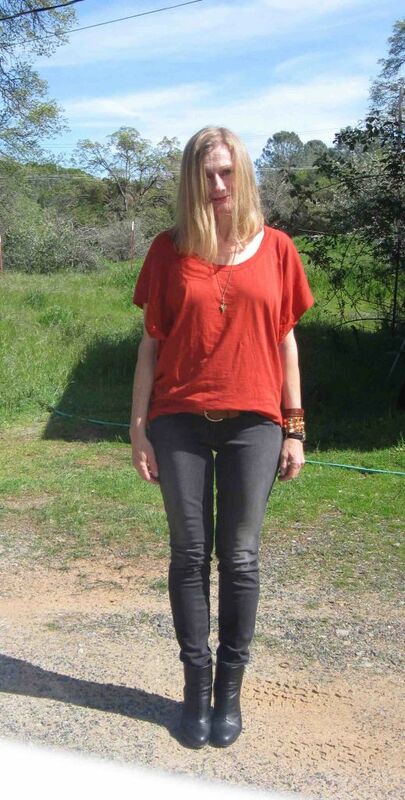 Sized up skinny jeans from Levi's, tee also from Zara and same necklace as above. Picture 4 -- Today, prior to the shower. White tee H&M, True Religion Camerons in Sem Defiance wash. Plus all the accessories I am currently obsessed with: the McQ razor bracelet, the Adia Kibur necklace, the Splendid sandals and the J Crew Boys belt. Here's the question of the day and honesty is sought. 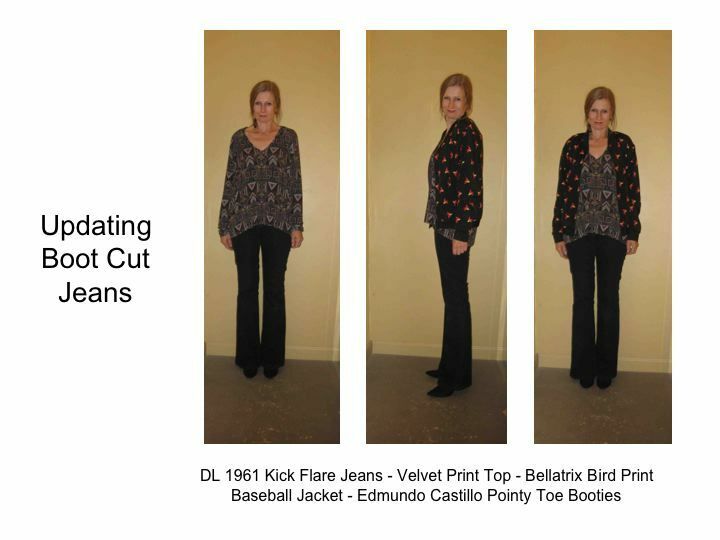 The outfit in pics 1 and 2 -- does this silhouette do me any favors? Something about it makes me look bigger than I am -- the high neckline, the undefined waist and the top which clearly ends at my widest point. Should I tuck the top, or wear the pants with a different tucked top, something with an open neckline? Nothing here was fussed over, every thing just grab and go. I try to pull together at least one WIW a week. Just so I don't get too lazy! Even though my outfits start to look a lot alike. Picture 1 -- WIW today, it was windy in the low 60s. Picture 2 -- My first try. It is so hard for me to get out of my slouchy cardis. But I realized, slouchy tee needs a more structured topper so I opted for this unlined leather jacket I got last year from BB Dakota (shown in #1). The other thing I changed was my bra! Picture 2 shows me in an old, ill-fitting Vanity Fair bra. Dare I say it creates a frumpier, definitely larger silhouette than the bra I'm wearing in picture #1. Picture 3 -- As in #1, the new Simone Perele is worn here. Picture 4/5 -- When I am uncertain about something, I will flip a coin and then live with the decision. Coin flip said to keep this Alexander McQueen razor bracelet. It may not fit right, but my boyfriend thought it looked evil and he liked that. Now I've scratched it so I guess it'll be part of my accessories collection. Thanks for looking! Have you experienced the effect of a better-fitting bra? The jeans are the recent True Religions that you can see look a bit lighter on a bright day. Nothing special here but a true COTG outfit (CocoLion On The Go).